"41MR12, Burial III, 59" by Timothy K. Perttula and Robert Z. Selden Jr.
DECORATION: The rim has a series of 24 nested incised triangles (each defined by four incised lines), 12 of which point downwards from the rim and the other 12 point upwards from the rim-body juncture. The vessel body has a vertical brushing decoration. 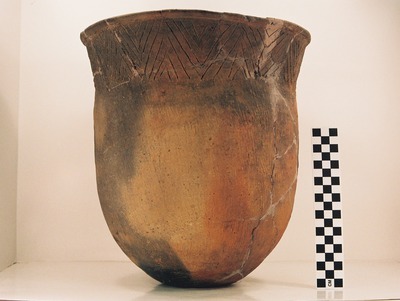 Maydelle Incised jar from Burial III at the Ben McKinney site.